As drummer for Mastodon, Brann Dailor has played thousands of live shows, from tiny, packed-out clubs to huge TV shows and mega festivals. To complicate matters Dailor doesn't have to worry about keeping the most exciting metal band of the 21st century on track from behind the kit, he's also taking lead vocals on a hefty chunk of the Mastodon cannon. This month we pick his brain on playing live as he shares key tips and stories on how to put on a great show from behind the kit. Learn how to play Iron Maiden classic 'Run To The Hills', Faith No More's 'From Out Of Nowhere' and 'Don't You Forget About Me' by Simple Minds. Plus there's all of your favourite lessons from Pete Riley, Colin Woolway, Jason Bowld, Mike Sturgis, Kyle Cullen and Erik Stams, and our brand new tutor Pat Garvey. 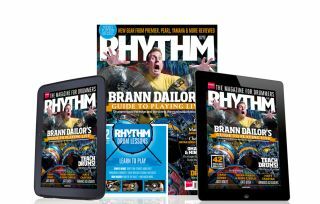 The December issue of Rhythm is available now in all good newsagents, online and digitally on the Google Play store and Apple Newsstand.